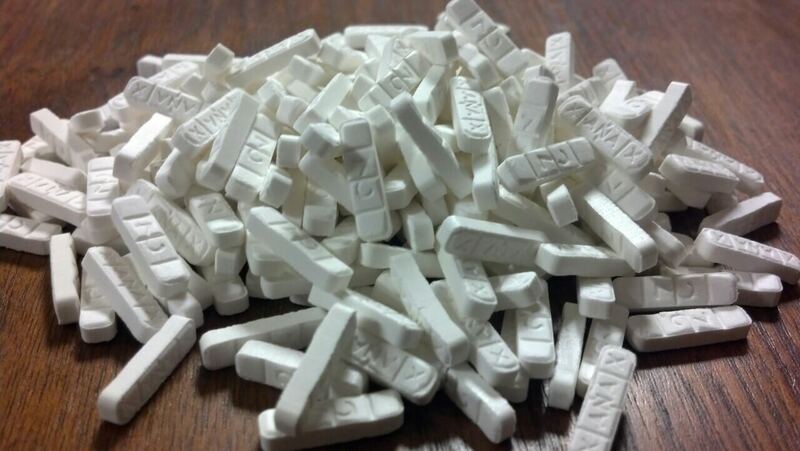 Xanax High - Dosage, How Long Does it Last, How Many to Get High? The generic name for Xanax is alprazolam, and it’s a potent benzodiazepine drug used to treat panic disorders, anxiety disorders, as well as anxiety that is as a result of depression. The psychoactive ingredient in Xanax is alprazolam, and this ingredient affects the way the central nervous system works. Being in a class of drugs called benzodiazepines, it slows down a person’s central nervous system. It is a sedative or depressant. This drug acts on a person’s nervous system to increase the production as well as effects of a nerve-calming agent known as GABA. Although the drug is very effective in helping people who suffer from disorders like panic disorders and anxiety disorders, it is likely that people may abuse it. Xanax abuse is a big concern and everyone who takes this drug is at risk of overdosing, but the risk of overdose is more in people who abuse it. The dosage individuals should have is about 0.5mg to 4mg, but people who abuse it will most likely build up tolerance and take more than the recommended dosage. It is possible that you can become psychologically dependent on benzodiazepines like Xanax. Even at doses that doctors have recommended for medical treatment you could still have physical dependence on Xanax. That said, let’s look at who is considered to be at risk of addiction from Xanax use. The risk of becoming addicted to Xanax is associated with the mode of administration and intention for use. If you use Xanax to get high or for recreational purposes, then you are at risk of being addicted. If you take higher doses of Xanax, say more than 4mg/day then it could result in psychological dependence. Does Every Xanax User Get Euphoria? Euphoric effect does not appear as one of the adverse reaction associated with Xanax, however, users of this drug may experience the feeling. The euphoric effects tend to happen infrequently when the medication is used as prescribed by a doctor. However, because the recreational users of Xanax take it in different ways including snorting, it is likely that they get the effect. Certain population of people are said to experience positive mood effects than others, and abusers of Xanax are mostly young people and adolescents. How Xanax Gets You High? The reason why doctors prescribe Xanax to patients is to lower abnormal brain activity something that creates a calming effect on the body and mind of an individual. To be specific, Xanax works on the GABA activity which is responsible in restoring the natural balance of the brain and reducing excitability. There are many drugs that affect the central nervous system (CNS) and they function differently. When it comes to Xanax, the primary effect is to increase GABA activity and this makes an individual to feel calm and drowsy. Such effect is beneficial to people who suffer from sleep disorders, anxiety, and other mental health issues. Xanax high may also present with other signs which include dizziness, unsteady balance, and lightheadedness. The drug may also give rise to other side effects such as stomach issues, intense drowsiness, and changes in mood. If a person has a bad Xanax high, it can make them to be very irritable. Another thing people need to understand about Xanax is that the side effects aren’t just limited to those who get the high or those who take much of the drug. You may find that even a person using normal doses of the drug may as well experience serious side effects such as hallucinations, seizures, and suicidal thoughts. How Long will it Take for the Xanax High to Set In? As an anxiety relieving drug, it is touted that it can take effect within half an hour after you take an oral dosage. What this means is that you will begin feeling the effects of a single dose say after 15 to 30 minutes. The effects will last for a couple of hours – the peak levels being attained after one to two hours. The peak levels of the drug in blood is when it has attained it full effect. And, a 0.25mg Xanax dose can reach those effects though it mostly depends of how a person is tolerant to the drug. Other factors such as body weight also help determine the dosage that is able to give the effect. Looking at the relationship between having food and slowing or accelerating the high, there may be no any relationship. If a person crushes and snorts the drug, the high is achieved somewhat immediately, however, doing this can be very dangerous because it immediately delivers the drug to the brain something that increases the risk of having an overdose or adverse side effects. How Long Xanax High Lasts? Being a fast-acting drug Xanax doesn’t have a very long high and this is one reason the drug is abused by users. Because the users want to get the high fast, they may use it in unusual ways such as crushing and snorting. How Long Xanax Stays in the Body? The drug will begin to show effects in body in about 15 to 30 minutes after you have taken it and it will attain peak level in about an hour or two. The full effect of Xanax takes on about 5 hours in the body. However, after the full effect, there will be traces of the drug in the bloodstream. The half life of the drug is about 11 hours meaning it takes about a day or so for the drug to be eliminated from the bloodstream. Because the effects of Xanax usually wear off in a few hours, patients are prescribed to take the drug several times a day. Chronic use of Xanax and other benzodiazepines can remain detectable in urine for about 4 to six weeks following your last dose. In case you just begun taking Xanax you probably want to wait for about a day before a scheduled drug test, but for infrequent users, 3 days may be appropriate. What Erowid Says About Xanax High? Erowid is a famous drug experience database that features various accounts for people seeking and achieving a high from Xanax. Looking at what people say, it can be summed up that most users experience a snug, cozy feeling rather than an intense, euphoric high. Another common experience is a pleasant drowsiness. Those who are high of Xanax won’t want to do so much other than lying in their bed or zoning out on their couch. Almost every person who takes Xanax notices some effect on their feeling and anxiety levels. Those that use the drug as prescribed tend to experience less noticeable effects than people who take the drug in higher doses or those who take it for recreational purposes to feel high. If you have experimented expansively with some other drugs previously, you might need to have several doses of Xanax to find out which one gives you the high you want. Most recreational users will try boosting the high they get from Xanax by combining it with some other drugs such as a bowl of weed, alcohol, or MDMA. These users may not be aware of the danger they are putting themselves into when they combine Xanax with other substances – it can be fatal. Xanax is a prescription drug meaning that it is only meant to be prescribed by a doctor and not bought over the counter or otherwise. It is not wise to have larger or smaller doses or even use Xanax for longer period than it has been recommended. If you have side effects, talk to your doctor immediately – never stop taking the medication unless the doctor has directed you to do so. If you try quitting Xanax cold turkey, it can be pretty dangerous. You need to taper down the dosage to allow for a safe detoxification process. Xanax should be taken in whole by swallowing it without chewing, crushing, or breaking the tablet. Crushing, chewing, or breaking the tablet would mean that you have immediate release of the active ingredient to the brain, which gives you a quicker high. However, this high may not last long and it could result in a person taking too much of the medication. If Xanax isn’t treating your mental disorder, make sure you see the doctor. You should not up your dosage without talking to a doctor. Again, you should not stop taking the drug abruptly because the withdrawal symptoms tend to be severe- they could result in seizures or even death.